It’s no surprise that snorkeling and South Florida go hand in hand. It’s an exciting activity that showcases the beauty of the Florida’s ocean ecosystems and its diverse wildlife, while providing an escape from the extreme heat and humidity. Snorkeling is not very demanding activity in terms of training or equipment, and one need only be a good swimmer and have a mask, snorkel and fins to enjoy this. 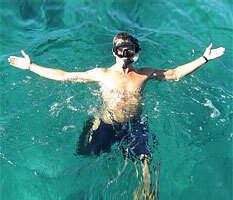 Snorkeling with Sea Experience is fun, easy and safe. We will outfit you with the proper equipment and our knowledgeable crew will teach you the basics of this fun water activity. Ft. Lauderdale, FL has three natural reef systems which run parallel to the coast. The first reef line extends from the south end, near Hollywood, Florida, and extends north to Pompano Beach, Florida. This first reef line is where we enjoy our snorkeling activities, depths are generally between 15′ – 30′. Our local snorkel reef, named the Fort Lauderdale Twin Ledges, is about ½ mile offshore. This natural coral reef is 7 feet at the shallowest point to 20 feet at the deepest. This beautiful South Florida snorkeling reef hosts a variety of colorful marine life. You will be absolutely amazed at the underwater world that lives just right off the Ft. Lauderdale Beach. For more information, pricing and times on our snorkeling trips, please visit our Snorkeling Trips Page.